After we got our Sony LCD panel mounted, we got some questions about how we planned to control the cursor while lolling on the couch. We had not given the problem much thought as the answer seemed pretty obvious: a wireless keyboard and mouse, of course. Wasn’t that the whole point of having a wireless keyboard? That theory was fine until we realized that most of our interactions with the screen consisted of maneuvering the cursor for selecting a movie on NetFlix or choosing a TV episode on Hulu. Trying to manipulate the cursor with a wireless mouse and a large keyboard from across the room made it clear why readers were asking those questions. After a bit of research, the interns came up with several potential solutions. 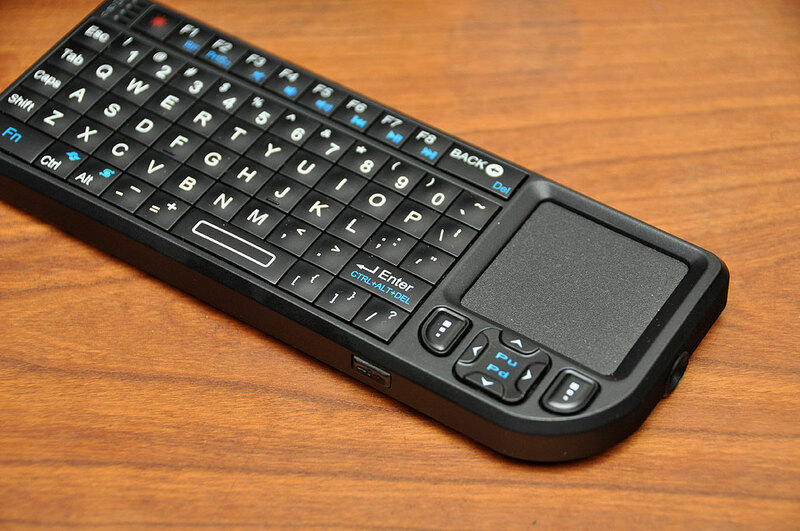 The first of which is this cool little keyboard from Magic-Pro. The keyboard is sold through their US reseller, Pyramid Distribution. We have not had time to peruse the entire site, but they have all kinds of funky cool gear and gadgets which readers may find useful, entertaining, or just plain fun. The Magic-Pro communicates with the computer via a 2.4GHz wireless link. 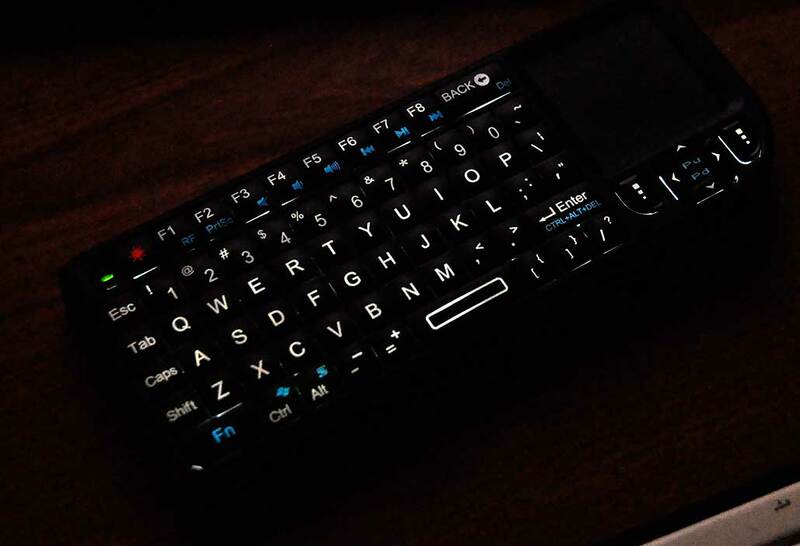 The transmitter/receiver dongle is housed in the side of the keyboard. Normally, it is stored completely flat against the side (it is partially out for illustration purposes). To use, just remove and insert the dongle into any free USB port on the computer. The integrated carrier is a nice feature as dongles are easy to leave back at the office. One of the nice touches of the Magic-Pro is the trackpad will operate in both the horizontal or vertical orientation. This is especially convenient when using it just as a cursor controller. When making a presentation, the vertical grip would be more comfortable and allows easy access to the built-in laser pointer. We chose the Magic-Pro from out list of potential solutions to check out first because of its ultra-compact size. We would have preferred a Bluetooth option instead of the dedicated dongle as it would have made a nice pairing with the iPad. In any case, we’ll give this little keyboard a thorough workout and report back on how well it performed in a few weeks. 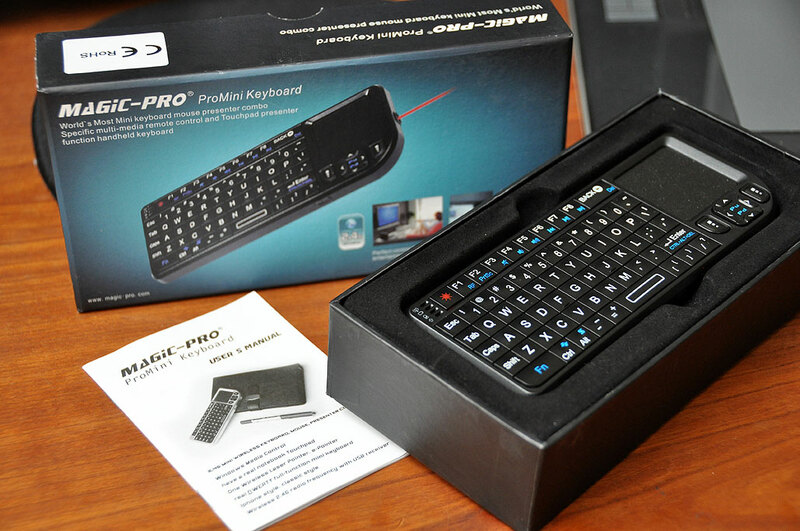 As a side note, we got the Magic-Pro keyboard before Apple’s new wireless multi-touch trackpad announcement this week. Curse you Apple for always creating things we want, but didn’t know we needed! It seems we now will have to take a look at THAT as well…work, work, work. Update: As per request…here are a few pics of the backlighting.